Have you ever wanted to know more about cohousing? Over 20 folks had the same interest and took this interest further and joined a workshop “Is Cohousing for You?”. Organized by Ravens Crossing Cohousing and West Wind Harbour Cohousing, the workshop was held on 5-6 May 2018 in Sidney. It was led by the renowned Dr Margaret Critchlow, co-founder of Harbourside Cohousing in Sooke with support from members of Ravens Crossing Cohousing. The workshop also included information sessions on newly-formed cohousing communities on Vancouver Island – West Wind Harbour (Sooke) and Ravens Crossing Cohousing (Sidney). Participants came from near and far. Some folks hailed from close to our future homes on the Island: Sidney, North Saanich, Victoria, Esquimalt, Nanoose, Salt Spring Island. In addition, we had participants coming from Greater Vancouver, Salmon Arm, Portland Oregon, Calgary, Toronto, and even Moncton, New Brunswick. We learned about the nuts and bolts of creating or joining a cohousing community. What might it cost? (market value in the same area); what expectations are there for me from the group? (some, depends on what YOU want to be involved in); will I still have the privacy I need? (other cohousers say yes! ); Is it for me? (you decide, it isn’t for everyone); is there green space? (fortunately, yes); garden beds of some kind? (likely)... and so on. We learned that the cohousing community makes the decisions on design, pets, parking, guest rooms in the common house and so much more. Take-away messages were that cohousing is a commitment, it is about assuming good intentions, attention to communication, some shared values and a great deal of laughter and curiosity. What were the results of the workshop? Well, not only did the participants learn more about cohousing and living in intentional community, they ended up learning as much about their fellow participants and themselves! 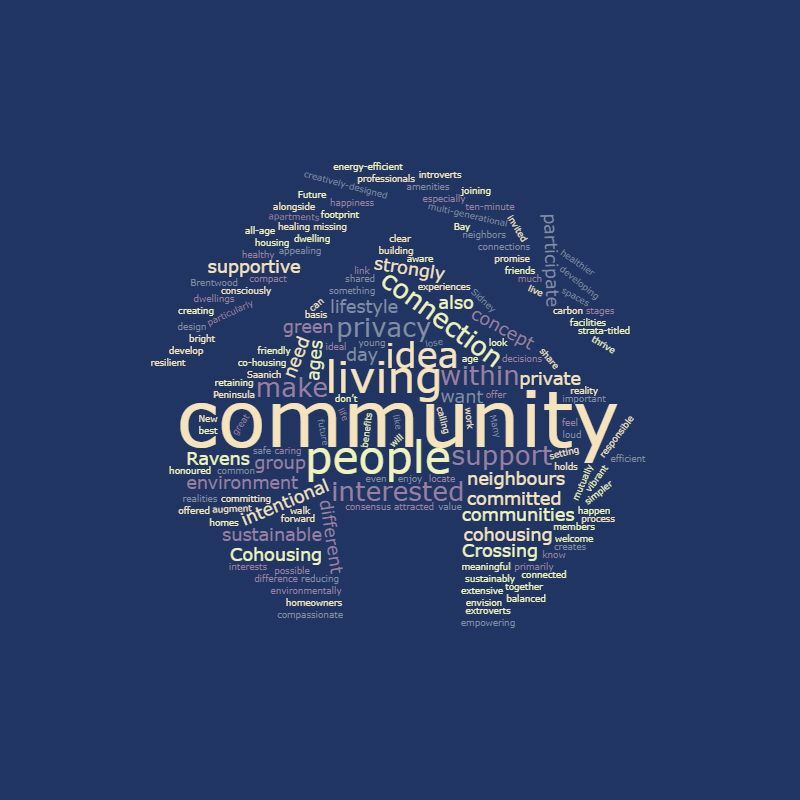 Over the course of the weekend participants were encouraged to ask themselves “Is Cohousing for Me?”. Of those gathered at the workshop and the information sessions many signed up to learn more and be further engaged. They have joined the existing Cohousing Communities as Associate Members. Over the next 3 months our new Associate Members will have the opportunity to participate in business and design gatherings and learn more about our cohousing community specifically and cohousing in general. Interested in knowing more about cohousing? Visit the Ravens Crossing Cohousing and West Wind Harbour Cohousing websites. The next “Is Cohousing for You?” workshop will be held on 7-8 July 2018 in Sooke. You can check out Eventbrite to register. Come join us! We have a 2020 vision...hoping to move in around that time. Barb Whittington on behalf of the Ravens community.